Bollywood weddings are big ceremonies filled with colour, energy and a lot of dancing. They are a central part of Indian traditions and are events that people plan for a great deal of time. Traditional ceremonies can last several days, with a religious ceremony and close family gathering on the first night, the sangeet on another day and a separate day for the main celebration and reception. Every event takes a huge amount of planning because there are so many different components that go into it. The reception is a very energetic celebration that can see several hours of Bhangra dancing. Led by a soundtrack of traditional folk and modern music, blending elements of several different genres, guests quickly find themselves on their feet. Those who don’t know the dances beforehand will pick them up very fast. Some couples even hire professional dancers to lead and entertain guests. Everybody attending a Bollywood style wedding is encouraged to wear vibrant, colourful clothing. Women don’t need to be afraid to wear something that stands out and can also add eye-catching jewellery as well to really set off their outfits. A traditional sari or lengha will look the best but you can also choose a jewel-tone dress and a shawl. 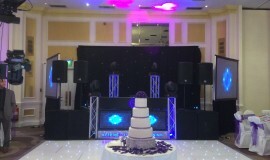 With music and dancing being such an important part of the celebration it is important to choose the right DJ. You want to select an experienced Bollywood wedding DJ who will create the best playlist for you, entertain your guests and help everybody to have fun. DJ Arun Kalyan at AK Musik is a great choice when you need a Bollywood wedding DJ, and holds more than twenty years of experience in the business. With top of the range equipment that can be tailored to suit your venue and guest list you are guaranteed a great service. We are happy to attend events all across the UK and will bring a touch of class and sophistication to every celebration. To find out more please browse our website, have a look at some of the images in the gallery and read about the different packages we can offer.